I’d like to live in a reality where all the insane Japanese car magazine rumors were actually true. In that universe, the NSX never ended production in the 2000s and today has a twin-turbo V10 engine, the Mazda RX-9 totally exists and is a certifiable 911 killer, and the new Nissan Z is a joint venture with Mercedes. It’s a nice world for sure. Also in it: Lexus makes a twin-turbo V8 SUV that can compete with the Lamborghini Urus. Okay, cool! Take this with a huge gallon of salt, but here’s the latest rumor making the rounds from Japan to get excited about, probably needlessly. According to Japan’s fantastically named Spyder 7, Lexus is said to be planning—for a 2020 launch—a powerful and expensive flagship SUV that can take on Lamborghini’s new people-hauler. 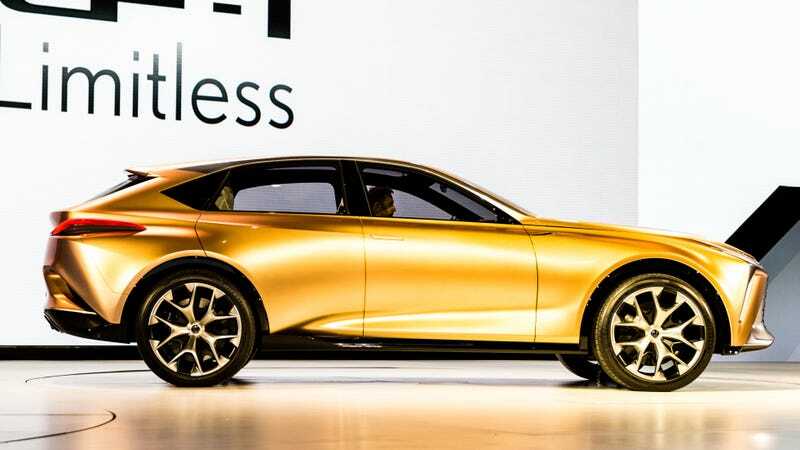 It’s said to be inspired by the Lexus LF-1 Limitless, which I legit forgot about until just now. As a pioneer of the luxury crossover market, LF - 1 limitless offers a new luxury direction to diversifying customers’ lifestyles. It is a flagship SUV that inspired by a trained Japanese sword and expressed supple modeling with a flowing movement. In the scoop site Spyder 7, we produced an expected CG of the production model based on the information. Based on the concept model pursue a classy feel like Lexus flagship SUV. Both sides were boldly gutted intakes and air ducts arranged to give sports. In addition, as a three-dimensional design that involved lights in the plating of vertical lines, he created an image of a luxurious front despite of flagship. Basically, it’s gonna look cool and sporty. More importantly this thing is said to have the new 3.5-liter twin-turbo V6 from the LS packing about 425 HP for the base model, and a 4.0-liter twin-turbo V8 with 660 HP for the top one. It’ll be cheaper than a Urus but still pricey: around $150,000, Spyder 7 says, putting it in a true supercar class of SUVs. Is it all plausible? Maybe. Lexus has been moving even further upmarket and trying some interesting new things lately, like the LC coupe we’re fans of here at the office. And there’s clearly a market for uber-powerful, uber-expensive SUVs. As the sports car segment dwindles, that area seems to be picking up the slack and attracting wealthy buyers who want brutal speed with no compromises. So why let AMG and Lamborghini have all the fun? On the other hand, I’ll believe a 660 HP twin-turbo V8 SUV from Lexus exists when I see the damn thing sitting on the dealer lots!